Perched on the cliff tops of the Eastern Knysna Head, you will find the magnificent Pezula Golf Estate in Knysna. Executive homes surrounded by coastal fynbos enjoy views of the Pezula Golf Course, the Knysna lagoon, the Indian Ocean or of the Outeniqua Mountains. These homes are popular as holiday rentals in Knysna - especially those who came especially to golf in South Africa. The 18-hole championship golf course at Pezula was designed by Ronald Fream and David Dale of Golfplan, California, USA. 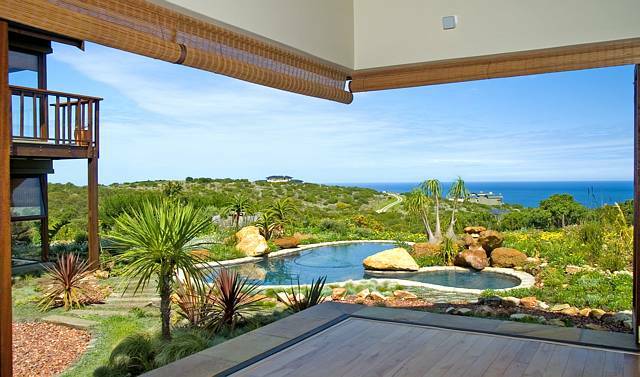 The course optimises the space of the 254 hectare estate to ensure maximum privacy for the Pezula home owners. The lifestyle here is one of absolute luxury. The 5-star Pezula Hotel & Spa is right on the doorstep, where you can enjoy an indoor heated lap pool, world class spa treatments, a fully equipped gym with private trainers, and Zachary's gourmet restaurant. For lighter meals the golf clubhouse deck offers great seating with views across the practice putting green. Pezula is a child-friendly estate. Here kids can ride bikes with freedom, play a game on tennis, enjoy the communal outdoor pool and cabana, or play on the jungle gym. Nature abounds in this estate with prolific birdlife year round and buck that roam the natural vegetation. There are nature trails that meander through the indigenous forests and take you to the beaches below the cliff tops to the warm waters of the Indian Ocean. The entire Pezula estate is secured by guarded entrances with booms, cameras and patrol vehicles. The homes are built according to architectural guidelines which allow for variety in style, while also maximising privacy for each home in Pezula Estate. The picturesque Knysna town is only a short drive away, where shopping and dining experiences are plentiful. The Knysna Yacht Club at The Waterfront is popular amongst residents and those visiting Knysna, who enjoy sailing or just some pleasure craft. For permanent residents there are excellent schools in Knysna to choose from, including Oakhill Private School, Montessori School, Knysna Christian School and Knysna Primary and High Schools. Health care in Knysna is also of top quality and the fully equipped private hospital in Knysna is part of the "Life" hospital group. Knysna is ideally located in the Garden Route. Pezula Estate is only a 40 minute flight from Cape Town and a 40 minute drive from George Airport. This spectacular setting with its 4-star amenities is what makes Pezula Golf Estate in Knysna a much sought after development and one of the most popular properties in South Africa.